As the light flashes on the very precise figures for Scotland to reach its climate change obligations – and the companies needing to be divested away from immediately, focus turns also to the disastrous state of our lochs rivers and seas. Never mind the tragi-comic ‘War on Plastics’ (see also ‘War on Drugs’ for previous success stories in this series) the state of our marine life has come sharply into view. The story, as Ecocide tends to be, is both global and local. The Ferret have recently highlighted a full length version of this video of lice infested salmon in a Scottish fish farm, and been told that the Scottish Government confirmed officials would inspect it “immanently”. A video shot underwater on 27 August 2018 inside a cage at Vacasay fish farm in Loch Roag showed hundreds of sea lice feeding on salmon with open wounds and damaged tails and fins. Whilst the issues is being presented as an animal rights and cruelty issue (which it surely is) it also raises significant questions about first; the ‘Good Food Nation’ and the constant cheerleading about salmon as the champion export of finest Scottish produce; and second the rights of coastal communities to have their own marine habitats protected from these rapacious and damaging companies. If a company abused animals on land like this with a significant damaging impact on the wider countryside local communities would be rightly up in arms. Who will win out – the natural environment and local communities who benefit little from these dire practices – or the handful of big companies leaching off the pretence that Scotland has high quality food standards? But as the UN announces it is taking its first significant steps towards legally protecting the high seas another new exploitation closer to home is emerging. 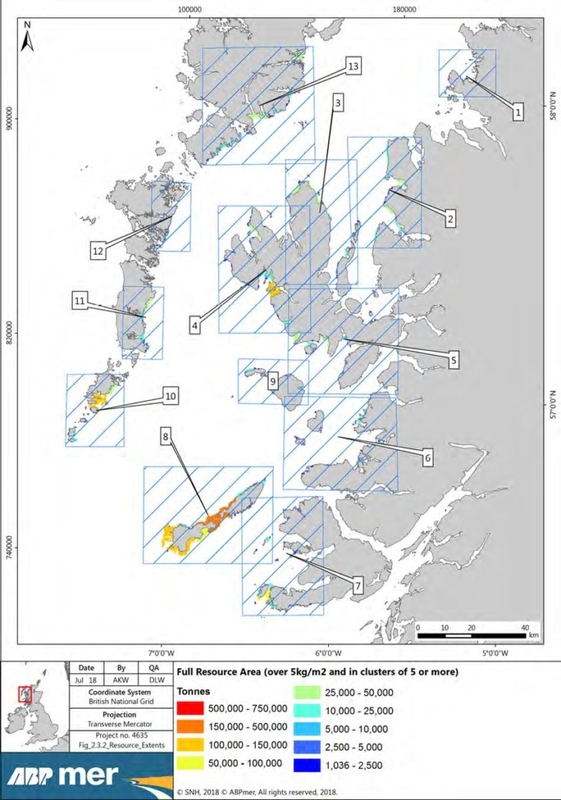 Marine Biopolymers has submitted a scoping report to Marine Scotland outlining plans to dredge for the kelp Laminaria hyperborea over a huge area of Scotland’s West Coast. Here is a map of Marine Biopolymers target points. [‘The role of kelp species as biogenic habitat formers in coastal marine ecosystems’]. “Marine Biopolymers want to tow a large-toothed dredge in strips through kelp beds ripping the entire plant up by the holdfast (killing it), then throw the holdfast over the side to ‘facilitate survival’ of invertebrates. Assuming any invertebrates survive this treatment, where are they meant to go when chucked back over the side? Their habitat is gone, the other invertebrates are not going to ‘budge up’ and make room for them, that’s not how biology works. Kelp is long-lived and the holdfast and stipe are a vital part of the habitat, supporting other seaweeds, and hundreds of species of invertebrate that feed fish, including cod, seatrout, and wrasse, lobster, crab, otters, birds, seals, and us. So much employment of coastal Scotland is reliant upon a healthy coastal ecosystem: fisheries and eco-tourism would all be jeopardised by the destruction of kelp beds. We can’t peddle Scotland to tourists as a beautiful pristine environment, whilst committing ecocide under the waves at the same time. Precisely because the marine world is ‘beneath’ or out to sea it is more vulnerable and need our protection. It is inconceivable to continue to promote our land and coast as tourist destinations for their beauty and natural wonder and allow this level of exploitation, or to conceive of ourselves as a Good Food Nation with lice-infested lochs. Thanks for raising this important issue, Mike. If kelp is needed, what’s wrong with gathering the vast amounts that wash up naturally on beaches after storms? I’d have to question, though, the statement “If a company abused animals on land like this with a significant damaging impact on the wider countryside local communities would be rightly up in arms.” Pig and chicken farming abuses animals and produces vast quantities of damaging slurry, but where’s the outrage among the general public? People like their cheap bacon and eggs too much. True although there is a large-scale animal rights, vegan and vegetarian movement and slurry is relatively contained whereas the impact of salmon farming is more widespread in terms of affecting the wild population? ie factory chickens don’t make wild birds ill? Is the similarity between Bond-villain plots (fleets of seabed-destroying vessels leave only source of fish in VillainCorp factopods), British military plans (let’s use anthrax to destroy enemy crops, leaving only source of food in Allied camps) and modern corporations merely coincidental? Marine Scotland are complicit in this, just as they have been in the unpoliced MPAs. Saying one thing in press releases, doing another under the counter. Vis non-action on issues like fish farm pesticides, breaches of SACs, etc. Sad fact of life is that folks, and especially those in developed economies, aided and abetted by greed, will stand idly by until environmental pollution and or destruction is up to their necks. The plastics industry, a sister industry of Big Oil is but one example of that. But it is by no means the only example. Parasitic by nature, and not by choice, we may like the dinosaurs end up the same way. I used to work summer shifts in the Alginate Industries seaweed factory at Keose on the Isle of Lewis. The weed was cut by hand. The cutters would place a floating rope across a bay and harvest on the low tide. As the tide rose, the weed floated up and was pulled in as a loose-knit raft that could be towed behind a small boat with a Seagull outboard. Take to a shingle beach, it was loaded onto lorries, broad to the factory, and our job as shift workers was to spread it with a fork onto a conveyer belt into the oven, through which it passed for a couple of hours and came out dry, for chopping and bagging at the other end. It was then sent by puffer to Gourock for processing into “alginates” – jelling agents for things like ice cream and toothpaste. I’ll tell you, if you saw the fist sized balls of maggots that went in during the summer when it had been rotting! We’d love it when the puffer came in. We’d get £30 for a few hours intense labour loading hundredweight (50kg) sacks. Never worked so hard in our lives! The point is, that this form of harvesting employed dozens of men around the island. Their method caused no damage to the surrounding ecosystem. A tuft of about 6 inches was left from which it would regrow in, if I remember rightly, about 3 years. It was a practice not devoid of ecological impact – there was some concern even then about the impact. Seaweed is important for giving shelter to young fish, and for spat (shellfish etc larvae) to attach to. But basically, the way it was done in those days, the 1960s – 1970s, was low impact with high employment benefit to the community. It was a continuation of the old kelping industry in a new form. In contrast, this dredging threatens high ecological impact and low value to communities. It should remain banned, and with good reason.